The war between the North and the South has made its way to the Arab Territories. Theoretically allied with the North, they instead decide to put up a forcefield to sequester themselves and block the Southern fighters. The Arab Territories quickly realize that their enemies in the South are much stronger, smarter, and more dangerous than they ever suspected. The war for the South to take Pearson Station in space continues to rage on, as both sides try to develop technologies to protect themselves and exploit their enemy’s weaknesses. Despite being spread between more than one fighting front, the South proves to be a formidable enemy for everyone that falls in their cross-hairs. 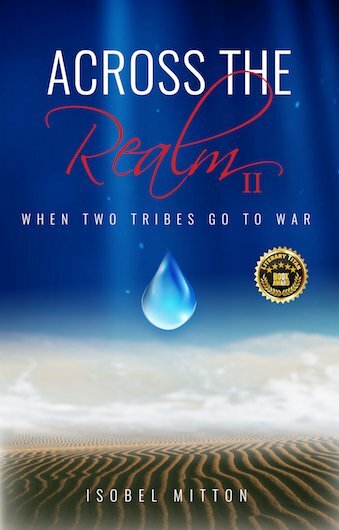 Across the Realm, Book 2: When Two Tribes Go To War by Isobel Mitton is the second in the Across The Realm series. After finishing the first one, I couldn’t wait to get hold of the second one and jump right in. It did not disappoint. Because there was less backstory to set up in the second book, things moved at an even faster pace than in Book 1, keeping me flipping the pages long past bedtime. The Arab Territories are a part of this book, and I felt like the presentation of the people living there was a bit negative. A lot of Islamic beliefs are addressed in it, and I felt like they were largely being treated as backwards beliefs, rather than legitimate religious beliefs. I didn’t find this to be an overwhelming feeling, however, and it did a wonderful job illustrating the differences between the characters in the Arab Territories, versus the rest of the North and the South. One of my favorite parts of the series is the skill with which Ms. Mitton creates differences between the characters in various parts of the realm. Each type of character is distinct. Although some characters are purely good, there are a number of characters that I both loved and hated in full measure in different parts of the book. Her ability to paint three dimensional characters that are incredibly realistic in their flaws and their strengths is part of what makes the book so addictive. Another strength of the book is the way no one side is being treated as wholly the bad guy. It’s presented primarily as the warring sides not understanding one another, and not understanding each other’s ways, being the source of the primary problem. Both sides believe in the other’s inhumanity and are unable to comprehend their actions and behaviors. Even as they capture and examine one another, they are not looking for the common humanity between them, but rather seek to locate the other’s weaknesses. All in all, this has been a great series to read so far. The book kept plowing ahead, gaining energy rather than losing it. Though I have not read a great deal of science fiction in this past, the Across the Realm series is inspiring me to read more. Posted on June 8, 2017, in Book Reviews, Five Stars and tagged across the realm, action, adventure, amazon, amazon books, amazon ebook, arab, author, belief, book, book review, books, ebook, ebooks, fantasy, fantasy book review, fiction, fighting, future, goodreads, humanity, inspiring, isobel mitton, kindle, kindle book, kindle ebook, literature, military fiction, military science fiction, muslim, novel, publishing, reading, religion, review, reviews, sci fi, science ficiton, science fiction, science fiction book, science fiction book review, science fiction novel, space, stories, terrorist, thriller, war, when two tribes go to war, writing. Bookmark the permalink. Leave a comment.